Being a neophyte in the kitchen, I often have a lot of questions when I make desserts. I usually call Mary Ellen, Brandi, or Cindy asking for assistance. I’ve asked them questions ranging from, When are the cookies “done” and okay to pull out? to What kind of butter should I use, unsalted or salted? Thank goodness for patient friends. I usually use up 1-3 lifelines every time I make something sweet. For the pumpkin parfaits that I made for last Friday’s Thanksgiving potluck, I initially bugged Selina. 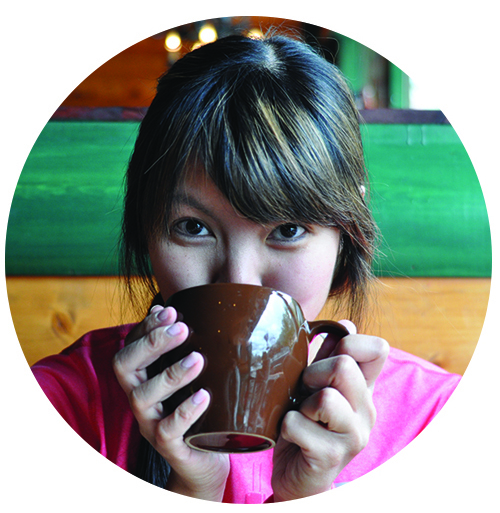 For this recipe, Selina schooled me on where to find Ginger Snaps (cookie aisle, who would have thunk it?) and what the difference between whisking and beating is. Whisking, you’d do by hand with a whisk. Beating, you can use the hand mixer! Simple enough. I swiped the recipe from Gourmet.com. I doubled this recipe and shared with Alan and his buddy and Bing and Deesh. Sprinkle gelatin over water in a small saucepan and let soften 1 minute. Bring to a bare simmer, stirring until gelatin has dissolved. 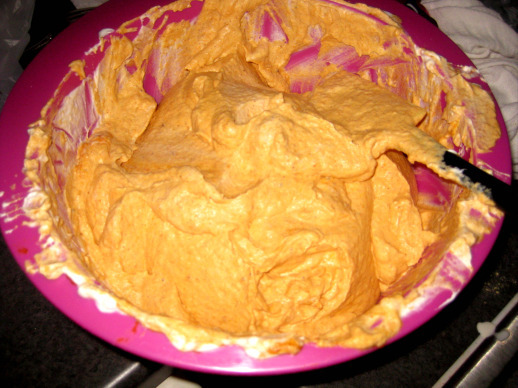 Whisk together gelatin mixture, pumpkin, brown sugar, spices, and salt in a large bowl. Beat 1 cup cream with 1/2 tsp vanilla until it holds soft peaks, then fold into pumpkin mixture gently but thoroughly. Beat remaining 1 1/4 cups cream with remaining 1 tsp vanilla until it holds soft peaks. Spoon about 1/4 cup pumpkin mixture into bottom of each glass, then sprinkle with some of cookies and top with about 2 Tbsp whipped cream. Repeat layers once, ending with cream. Cooks’ notes: Parfaits can be made 1 day ahead and chilled. I used one more lifeline and gchated Shane. I didn’t know what folding was and had a little help. Even made a video about it! After I finished folding, the pumpkin color lightened up. 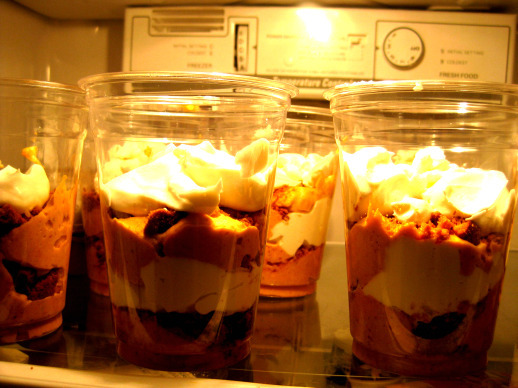 I assembled and set the parfaits to sit prettily in Alan’s fridge to chill overnight. I had a parfait to test the next morning and my verdict is that this is a keeper. I’d use more cookies next time because it was a bit too much on the cream layers. I LOVE the pumpkin layer. Apparently a lot of the girls at work do not like pumpkin or are allergic to cinnamon. However, Brittany, Deesh, and Bing claim they enjoyed it! Next article Home Made Oreo and Nutter Butter Truffles! !